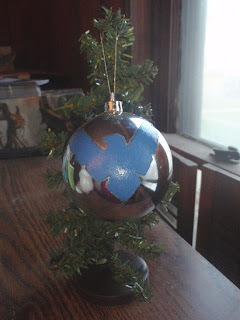 The Creative Crossing: Superhero Ornaments! I love superheros. Movies, TV shows, cartoons, comics. I just love superheros. So of course I had to make some superhero ornaments for my tree. Batman is my all time favorite superhero. I've been obsessed since I was a kid, watching Batman: The Animated Series. I can never get enough. Iron Man is a very, very, very close second to Batman (I think I have a thing for the ultra smart, ultra rich types, lol). And last (but most certainly not least), Green Lantern. I haven't been a Green Lantern fan for long. I always liked him on Justice League and really enjoyed Green Lantern: First Flight. Can't wait for the new movie with Ryan Reynolds! This is a redo from the original, which was silver with the symbol painted in green. I just didn't like it. So I had to redo it and like this one so much better! Do you sell these ornaments? i would love to get my nephew a superhero ornament. Your work is really good. You can email me at Harpe14@aol.com if you do sell these or if you dont im willing to pay you for them. I'm Dreaming of a Geeky Christmas!